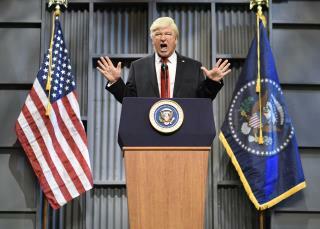 (Newser) – Alec Baldwin skewered President Trump again over the weekend on Saturday Night Live, and now the two men are continuing the animosity online. In a tweet, Trump made clear he hated the skit mocking his declaration of a national emergency. "Nothing funny about tired Saturday Night Live on Fake News NBC!" he wrote. "Question is, how do the Networks get away with these total Republican hit jobs without retribution? Likewise for many other shows? Very unfair and should be looked into. This is the real Collusion!" In a second tweet, he reiterated his view that the media "IS THE ENEMY OF THE PEOPLE!" Baldwin didn't appreciate the language. The 1st Amendment allows clowns like Baldwin to be unfunny and to Trump-pimp.